This is Jon Spencer, last maker at Foster & Son, making up the last for my first pair of bespoke shoes from the team. 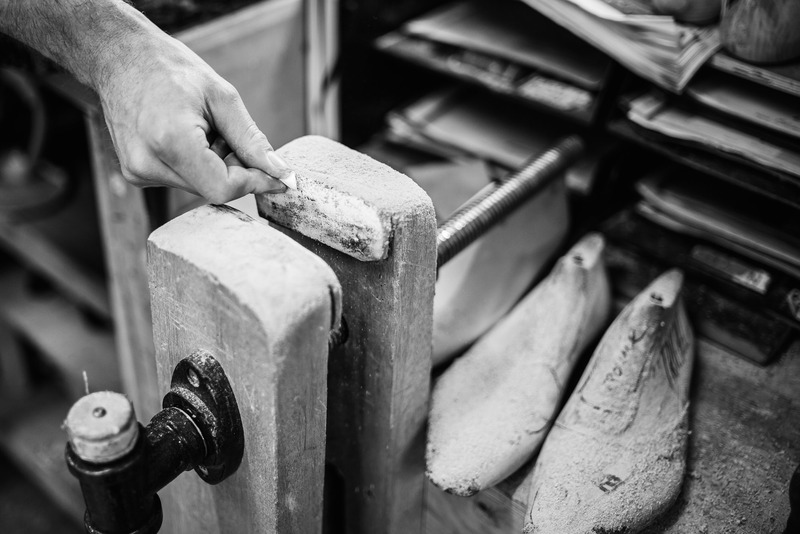 The black, Oxford whole-cuts will have the classic ‘West End’ Foster’s toe shape, slightly elongated and chiseled at the end – similar but more subtle than the Anthony Cleverley toe that Cleverley’s introduced a few years ago. They will also have the merest touch of Foster’s fading on the toe. 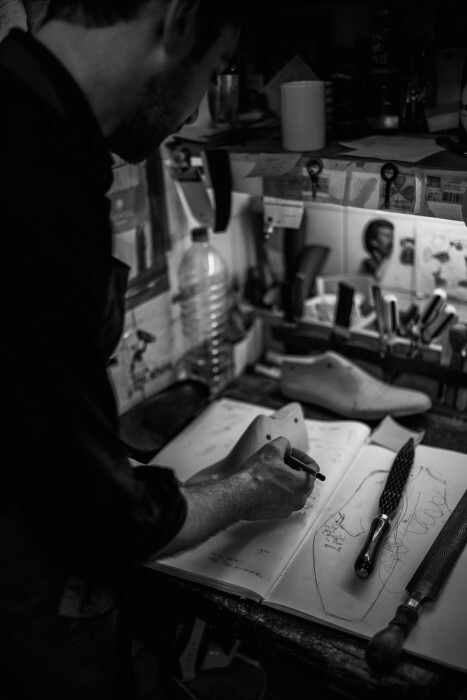 Last-making is probably my favourite stage of the bespoke shoe process, being far more art than craft. It is a wooden piece of sculpture comprising the shape of the foot on the back and a stylized toe on the front, with a subtle segue in between. There is no other aspect of menswear where the ideal piece of clothing is so physically shaped to the human form. A basted fitting for a suit is similar, but that is always a fixture of both shape and drape. The last-making process is also a highly significant one at Foster’s, given that it was a job done until recently by the much-revered Terry Moore. By all accounts Jon is doing an excellent job in Terry’s absence, however, and he still pops in now and again to see how things are going. Jon is one of the few lastmakers around that still uses the traditional large, hinged blade (shown above) to cut off the first few slices for the last. I’ve seen it used in many places – such as the expansive Berluti workrooms in Paris – but most admit it’s just for show. Jon also occasionally cuts from virgin, cuboid blocks of wood, rather than buying larger lasts from Springline and working them down. He says this is because those lasts can sometimes not leave enough room to work with difficult feet. 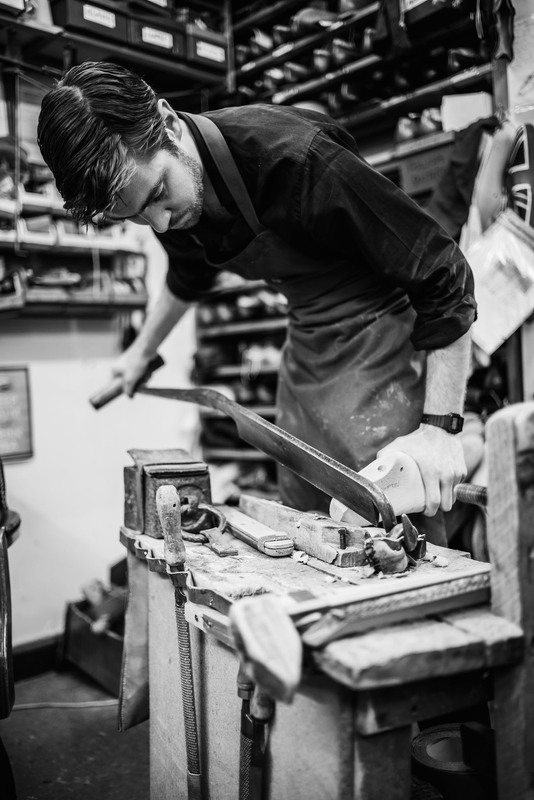 As with many aspects of bespoke, it’s not a question of any method being better, but simply which works best for the artisan in question. We will bear witness to that, of course, as the shoes take shape over the next few months. You can follow the discussion on Foster & Son bespoke shoes: Last-making by entering your email address in the box below. You will then receive an email every time a new comment is added. These will also contain a link to a page where you can stop the alerts, and remove all of your related data from the site. Simon, have you encountered any shoe makers using 3D printing to make lasts? The new technology is less artisanal, of course, but it’s likely to be more accurate. 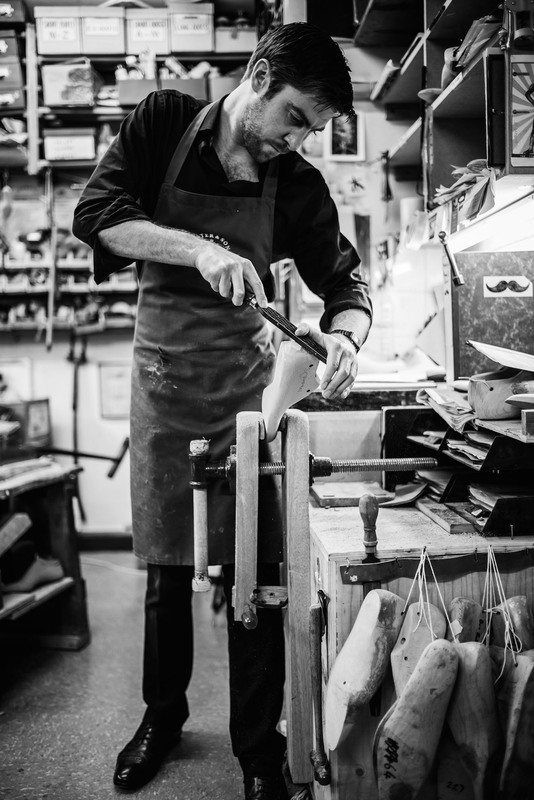 Do you mean to make bespoke shoe trees Charles? If you mean the lasts, I haven’t and I think there are a few reasons why. The wooden last is being created from a series of 2D measurements, so it couldn’t be created with 3D printing unless they were translated onto a CAD system, which isn’t easy to do with these 3D products. In fact, in areas where I have seen 3D printing used (eg jewellery) it is still only used for things like prototyping or showing designs to clients, because handwork is so vital to creating the feel of such things – the slope and twist across the top of the instep, for example. Interestingly, I’ve also seen some artisans going back to hand drawings away from CAD, because they prefer it. CAD and potentially printing would of course be much more powerful if you were mass producing. How would you explain the propensity of men to want bespoke/expensive suits, and then turn around and spend far, far less on shoes? May I ask, who is Luke Carby and does he accompany you on every visit, or do you take the photos yourself and he does the finishes? I was going to leave ask this on the “5 tips for shoes” article but i realised that its full of comments that never got a reply, hope i have better luck here. You suggested styles of shoes to buy, but not brands/sites to buy from at different pricepoints. Can you suggest anything from entry level and up? Sites with good sales in particular since everyone ive asked only knows of Herrings/Pediwear and nothing else. Brand wise ive heard nothing but Loakes/Barkers with the occasional Meermin. Are there any other entry level brands that can be found for around 100-150 pounds? Im confused as to why you dont hear anything about other brands at the entry level. Allen Edmonds tend to be the #1 most recommended shoe on international sites but that’s around 200 GBP. I would have thought that there would be some asian companies making decent full grain/goodyear welted shoes but nobody seems to know any, and almost all the brands i’ve heard mentioned are exclusively UK/American. Thanks for the tip – I’ll check back on those comments. As to brands, I don’t normally write about the cheaper brands (certainly anything under 200 pounds) because I have less experience of them professionally or personally, and the quality is usually pretty poor. Shoes are such a fundamental part of a wardrobe and can last for years if looked after properly, that people should really be aspiring to more than that. As to the quality, English brands generally reflect their quality in the price – so you know what you’re getting with Barker as opposed to Crocketts, for example. And one reason you don’t hear of that many is that there aren’t that many Northampton factories – I’d highly recommend English shoes as a starting point and unless it’s Barkers or Crocketts for example making for someone else, you rarely see that many other brands. These factories and the Victorian machinery they use are not easy or cheap to buy, hence the small number of brands. And although there are some decent Indian producers out there now (making for people like Grenson for example), they’re often lacking in style. I regularly read your reviews, in particular the shoes section. I will be in Central London in a few weeks, and I will be looking to pick up a few pairs of shoes in the sales. I was wondering whether you could recommend any shops to visit ? I have been told about john rushton, but I was wondering if you know of any other retailers worth visiting (aside from all the main retailers around jermyn street). I would like to try some alfred sargents, but I can’t find them anywhere! No Sargents don’t have their own retail. Rushton is a good shout, but apart from that there are no good multi-brand shoe stores. I’d suggest trying those main ones, and perhaps Trunk too. Thanks for your advice. If I can’t find anything there, hopefully Gaziano and Girling will be having a 90% discount sale! I appreciate that bespoke shoe costs vary due to the price of the leather used, particulary if you choose something exotic, but could you indicate how much Fosters charge for bespoke please. Whatever happened to Lodger? They used to have some quite decent shoes eand as I remember they tried using a 3d scanner to help with sizing.